Some motherfuckers are always trying to ice-skate uphill. 1998 saw something that nowadays seems impossible; a Marvel film, dark in tone, with the Stan Lee cameo cut from the finished version, made by a studio, New Line, owned by Warner Bros. the parent of DC films, and my word what a good film it was. 1998 was the year of Blade. I’m not sure that Blade can be categorised as a superhero film, neither does it get quite dark enough to be considered a horror film in my opinion, but whatever category you think Blade falls into, you must agree that it is possibly one of the best films that could be classified in either. Blade sees a half breed, Wesley Snipes, found as vampire child on the streets by Whistler, expertly played by Kris Kristofferson, who because a vampire bit his mother and killed her just as he was born wants vengeance on all vampires until he finds the one that perpetrated the act. Whistler keeps Blade’s vampiristical tendencies, like his thirst for blood, at bay with a serum he’s concocted. Whilst hunting the vampires that work for the evil Deacon Frost, brilliantly portrayed by Stephen Dorff, he comes across a haematologist, Karen (the brilliant N’Bushe Wright), who has been bitten by Quinn (Donal Logue), a vampire that just won't die. Taken to his lair, a warehouse, by Blade, Karen is saved from turning by Whistler and helps with the oncoming fight by designing some blood related weapons utilising her scientific skills. Frost meanwhile is at loggerheads with the Council of the House of Erebus, headed by the Pure Blood Dragonetti, (the wonderful Udo Kier), and wants a vampire apocalypse that wipes out humanity. He wants to raise the Blood God La Magra and rule the world by killing the Council and using Blade’s blood to make himself the ultimate vampire. The film comes to head in a huge fight when Blade must confront his vampire mother, realise his name is Eric (it may only be me that deems that fact important), save himself from blood lust whilst not killing Karen, and defeat Frost. Blade was nearly a perfect film. The special effects for the time were top drawer, especially the skeletons that turn to ash when a vampire is stabbed, and you got a brief glimpse at bullet dodging technology that would later be expanded on and perfected in The Matrix. It was beautifully shot by cinematographer Theo van de Sande, the scenery cuts between night and day and vice versa, and the car chase scene about half way through, were truly stunning. It is also possibly the best thing written by David S. Goyer, although I have a soft spot for Flashforward, and it shows what a true talent he can be when given a chance, which means it's easier to forgive him for things like The Crow: City of Angels and Nick Fury: Agent of Shield and Ghost Rider: Spirit of Vengeance and a lot more films that have a colon in the title I’m sure. The story was solid, the vampire lore utilised and invented for the Blade universe was compelling and excellently thought out, but where the film excels is its casting. I know from interviews with Dorff and Snipes there was a lot of tension onset. Dorff felt he hadn’t been given time to develop Frost as he would have liked, Snipes with his producer’s hat on wasn’t always available as he had decisions to make, and both seemed uncomfortable with set visits by the likes of David Fincher, but I believe that the tension and uncomfortable circumstances led to both to pull off performances that at the time I didn’t think possible. Snipes has always entertained, New Jack City, White Men Cant Jump, Demolition Man for starters, but I never saw Snipes as the strongest of leading men. 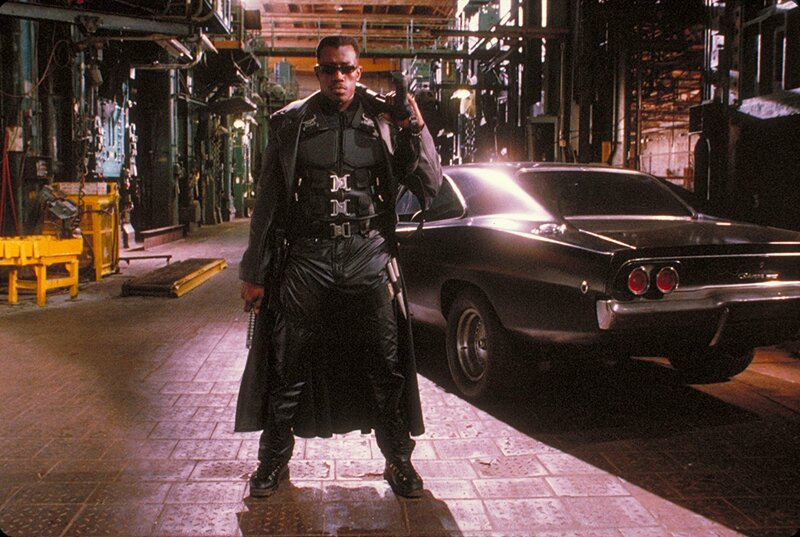 However, in Blade, he carries himself and an awful lot of the film with some aplomb. With Dorff I had always enjoyed a performance, Backbeat and S.F.W. were particularly good, but I never imagined him with the capabilities to be a huge star. In his role as Deacon Frost, I was genuinely surprised at how captivated I was by his performance, and I honestly thought that bigger and better things would follow, like global superstardom up there with Brad Pitt, which is probably why I’m not anyone’s agent. Alongside two highly surprising but incredibly welcoming performances you had the growly, testy Kris Kristofferson who, when he’s badly beaten and asks Blade for a gun to end his life, I'll admit to shedding a few tears for, and N’Bushe Wright as Karen, a star I hadn’t seen before but more than went toe to toe with her more famous colleagues. 1998 was a strange year. It was the year a mixture of events and people, that couldn’t work together today, produced something that, if it could be categorised, would be still the best thing ever made in that category. 1998 was the year of the Blade.